One of the largest importers of Chinese tractors into the Australian marketplace, Agrison is a family owned business that supplies affordable and quality tractors to the hobby farm and agricultural sectors. Operating in Melbourne’s North, Campbellfield, the company specialises in the retail of agricultural machinery, implements and diesel generators. The business has helped increase tractor ownership through competitive pricing, supplying Australians with value added tractors built in China. The concept of Chinese tractors has naturally taken time for consumers to appreciate, acknowledge and accept after the scepticism of the early days. Today, Australia’s major import partner is China, offering consumers the choice to own inexpensive and value added tractors. Tom, who owns a slashing business in Geelong, decided to go with Agrison after talking to a few people that had them. As a regional slashing contractor Tom is very pleased he chose Agrison, especially appreciating the 5-year parts warranty and backup service. 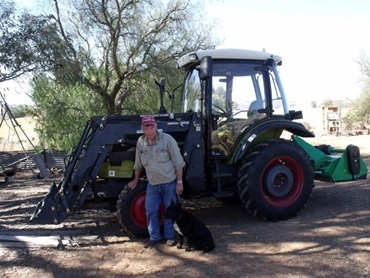 Colin from Orange, NSW owns a 50hp Agrison and uses his tractor for vineyard spraying, grass slashing and loading gravel. Colin currently has 625 hours running time with trouble-free usage. The high degree of engineering in the four-in-one bucket is a standout feature for Colin and he commends the value in the Agrison product. Bob from Narre Warren, VIC purchased a 60hp tractor 18 months ago and has been very pleased with its performance. He followed it up with another 35hp tractor from Agrison, and is very pleased with both machines.